Dreaming of powder snow, sunshine and off-piste skiing and large skiing areas? Stop dreaming and go to Tignes in France. It doesn't matter how good a skier you are or whether you are a skier or a snowboarder, here you will find whatever you are looking for. Off-piste chances are marvellous and with quite easy access. You can often use ski-lifts and slant right up to where you want to go instead of walking for several hundred meters at high level before you are on your way down again. In that pristine powder snow! Tignes is joined with Val d'Isère and together they make up the area called l'Espace Killy. You can buy card for ski-lifts covering the entire area and travel freely. Just remember to make an early start if you wish to move from one end to the other - the area is gigantic. If you want to try every slope in one week you will have to get up very early in the mornings. There is everything from skiing on glaciers to forests. Tignes is divided into a few small resorts, all with immediate access to the slopes, Le Lac and Val Claret. Le Lac is a bit further down and Val Claret somewhat higher up at 2,100 meters. A lot of people virtually lose their breath the very first day since you are a such a high altitude. Val d'Isère is at a somewhat lower level - 1,810 meters. From both places you can easily take the ski-lift further out into the system. Take a deep breath and get on the funicular - the mountain railway - to the top of mountain. Change for a cable car and you’ll soon be at the top of the glacier La Grande Motte as high up as at 3,460 meters. There is wonderful skiing on the glacier with a view of the mountain range all the way. This is sure to be one of the highlights of your visit to l'Espace Killy and is worth doing several times during your stay. The area has more than 150 pistes and almost 100 ski-lifts. There are about 25 green and just as many black pistes, 61 blue ones and 46 red pistes. Children have their own areas, sometimes fenced in. For snowboarders Tignes and Val d´'Isère are a real adventure. There are several big fun parks, some of them with absolutely gigantic jumps and a piste which is a halfpipe. The flat areas are few and it is rarely necessary for you to let go of your snowboard and walk. Want to learn more about off-piste skiing? In Tignes there are good chances of that. Take the ski-lift up the area SPOT and get help from the experienced instructors. The area is devoted to off-piste skiers and a sort of training area for off-piste skiing. If you need help with avalanche training, for example how to handle your sond and transceiver, the staff are specially trained to help you. Are you looking forward to an active holiday? At the end of the skiing there are masses of activities to choose from. Perhaps some after ski in the slope? Finish the day with a massage, sauna or a visit to the pools. If you wish to top your stay with outdoor activities there is everything from dog sledges to helicopter rides, from ice racing to ice climbing, paragliding and riding. Or, why not have a go at ski-joring after a horse? The shopping facilities are particularly good in Val d'Isère (depending on what you are looking for). Outdoor shops dominate with the latest designs in ski fashion, but there are also a lot of French delicatessens, jewelry shops and whatever you may need. In Tignes most of the visitors are primarily interested in skis and skiing, so the majority of shops cater for these needs. How do I plan my trip to Tignes/Val d'Isère? When selecting your area think about what type of holiday you and your travelling company primarily want. Those who opt for Tignes will want to be close to the best skiing and the most untouched rides. You may like to party and have a nice time at after ski, but good skiing is more important. Those who opt for Val d'Isère seem generally more inclined to partying and enjoy opening a bottle of ice-cold champagne at one of the outdoor cafeterias in the slope in the early afternoon. What sort of skier are you? At both resorts you can find everthing from luxurious hotels to cheap hotel rooms. There are also apartments you can book, which is a practical alternative if you are a large party or prefer to do your own cooking. The easiest way to get there is to fly to Geneva and then get on a coach. From the airport it takes about three and a half hours by coach. The cheapest way from many European countries is to travel by coach with one of the charter companies that run on these destinations. If you choose to go by car, you can drive up the door step and there are plenty of parking facilities. Over weekends during the height of the season there may be queues on the mountain roads up to Tignes and Val d'Isère. Val d'Isere is part of the ski area L'espace Killy together with 1 other ski resorts. Tired of carrying your ski equipment all the way to Val d'Isere? 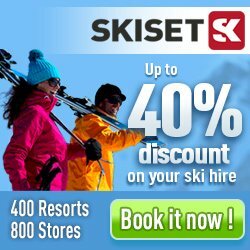 We offer pre-booking of ski equipment in Val d'Isere in cooperation with Skiset. When booking online you can save up to 50% compared with booking upon arrival. Here you will find in total 169 hotel, apartments and chalets/houses in Val d'Isere.